Our theme week this month is focusing on Endangered Species. We’ll spotlight 3 animals and giving you ways in which you can help. We’ll also have a guess the endangered animal post and a craft! We’re going to the mountainous rainforests of Africa to meet today’s endangered species. Grab your raincoats and let’s go meet this great ape. 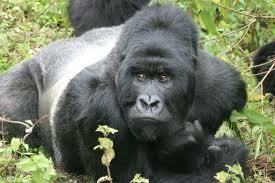 Mountain Gorillas live in high altitude volcanic mountains. They live in troops with one dominant male, females and their offspring. Mountain gorillas are generally very peaceful. 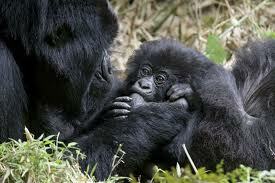 Mountain gorillas make a nest every night. They have very thick fur to help keep them warm. Mature adult males are called silverbacks. Mountain gorillas are such amazing creatures. They are gentle, social and intelligent. Habitat loss is just one reason these gorillas are endangered. The Dian Fossey Gorilla Fund helps these special apes, by tracking them and helping them in the wild. Check out their website. Another great way to help gorillas in the wild is by recycling your cell phone at your local zoo. Our zoo has a program as do many others. Remember everything little thing can help our endangered friends!